We added the Ajuga reptans ‘Mahogany’ and Iberis sempervirens candytuft for contrast. ‘Menton’ is one of several tulip selections that I planted either in the garden or in pots last fall. I particularly like the pale pastel rose-pink-apricot color of this one. Foliage added to the arrangement are the green of cleyera (Ternstroemia gymnanthera) and gold of barberry (Berberis thunbergii ‘Aurea’). The vase is Waterford crystal. Let me invite you to visit Cathy at Rambling in the Garden to see her contribution this week and that of others who accept her invitation to share what is flowering in their gardens this week. 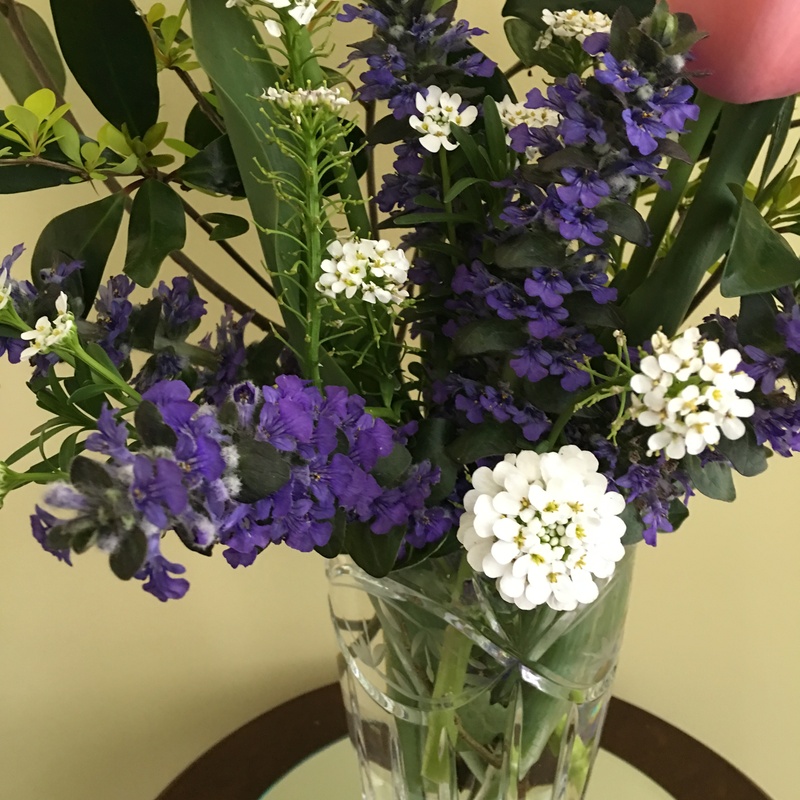 This entry was posted in Gardening, In a Vase on Monday and tagged Barberry Aurea, candytuft, Japanese cleyera, Menton tulip, Rambling in the Garden, tulip, Waterford. Bookmark the permalink. Gorgeous arrangement John and not just because I love tulips. I like how the tulips are centre stage and the other flowers accentuate them. I have Menton too and you’re right the colour graduations are beautiful. Thank you, Christina. I am a bit late to the tulip festival,but am learning to appreciate them more and more. 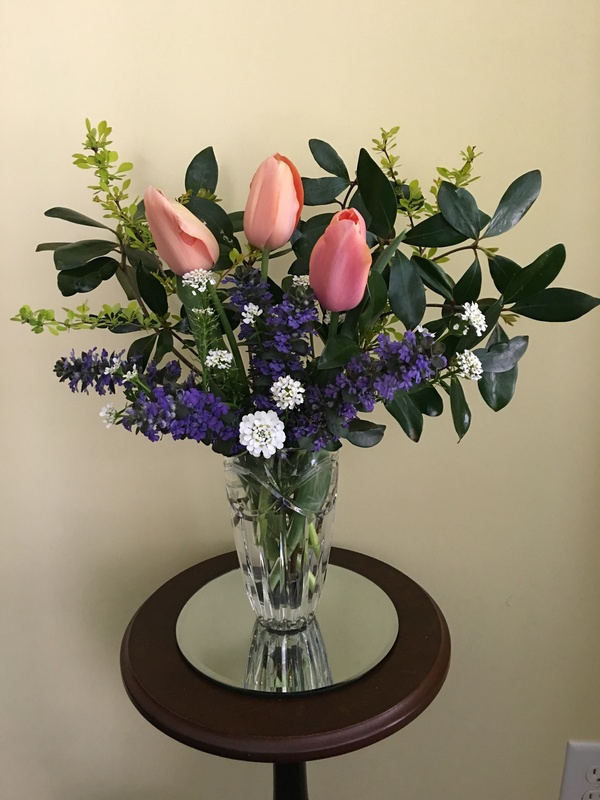 Yes – the thoughtful arrangement compliments the tulips well. The glossy dark leaves are perfect. This is really a beautiful vase mixing the tulips in with dark foliage and deep purple flowers. Thank you, Donna. I have a great Arranger with a good eye for these things. I am enjoying my tulips really for the first time in this garden. the blue flower is indeed ajuga. I will post a photo of it soon, so you can see how it multiplies. John, this is a lovely arrangement. The color of the tulips is exquisite and the blues and white of the other flowers work well. Enjoy this wonderful spring weather. Thank you, Susie. they are talking about frost this week, so out come the old sheets to cover some newly planted items…and the garage may be full. Can’t click “Like” on that! I love this color combination! In fact, it was the mix I envisioned when I first picked some peachy/apricot roses from my own garden this week but then I veered off in another direction. Thanks, Kris. You have so many options where you are. Beautiful vase and arrangement, John. Kudos to the Arranger! Thanks, and my Arranger thanks you as well. Gorgeous. Just what I need to remind me it is spring even if it’s -10C here right now. The arrangement reminds me of those lovely Victorian flower prints. 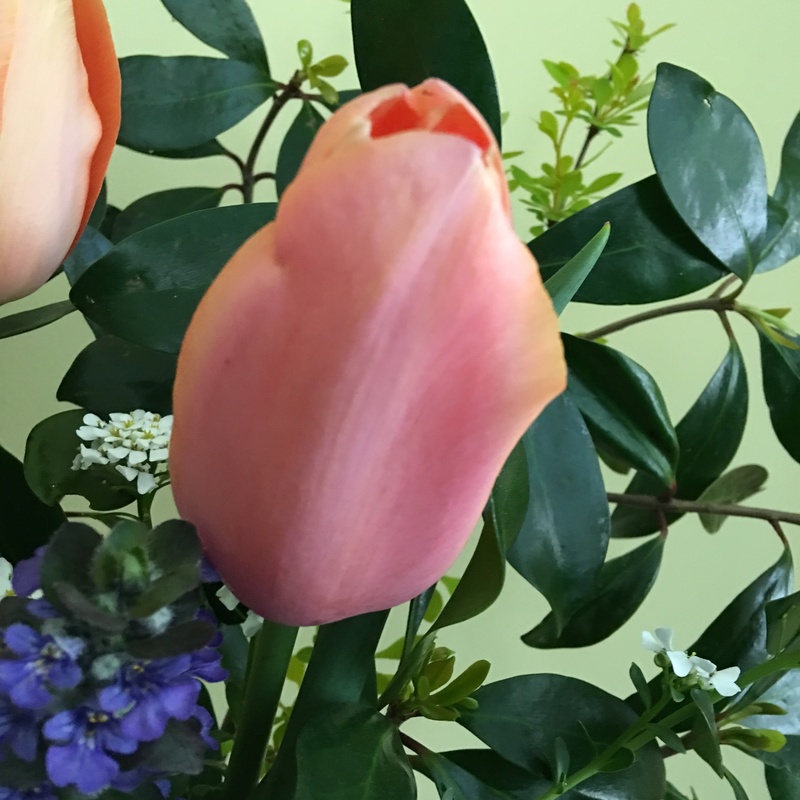 We have Menton tulips too – they are so elegant. Has to be a special order as they’re hard to get up here! Thank you, Susi. Your turn will come…and then I will be jealous of your spring show. It does get a bit prickly, but she knows what to do. What a beautiful arrangement. Love the tulip, beautiful color! Thank you so much for sharing! Thanks, Amy. I really didn’t know much about Menton tulips before I bought them last fall…just fell for a pretty picture. I am certainly pleased. Lovely! Well, we are on the back end of galanthus, chionodoxia and crocus. My super early Tetetete’s are up, I’ve forced buckets of forsythia but all my bulb forcing was thrown off by a 5 week stay in Florida (I wasn’t around to start them. ), and now, finally, the early daffodils and hyacinths are up, not blooming yet, but up is good. Up is real good. We’ve had snow and the lows will be 29. It is interesting to see what is happening in other parts of the country. Some are ahead of me, you are catching up. Thanks. What an elegant arrangement, I would have never thought of cutting a few ajuga stalks, but they look great in there as well! Thanks. The ajuga is one of the “stars” right now. Beautiful rich shade of apricot-pink on those tulips. The iberis complements really nicely. Thanks, Jason. You must take credit for being my inspiration to try tulips this year.